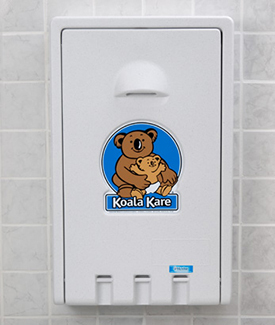 Changing Bed features smooth, concave changing area with nylon safety straps, two hooks for bags or purses and universal instruction graphics, safety messages in six languages and Braille. Pneumatic cylinder provides controlled, slow opening and closing of changing bed. No hinge structure exposed on interior or exterior surfaces. Changing bed secured to backplate with concealed, full-length steel-on-steel hinge. Unit is opened and closed with one hand and less than 5 pounds of force (22.2 N). Unit 22" W, 35 1/2" H (560 x 900mm).